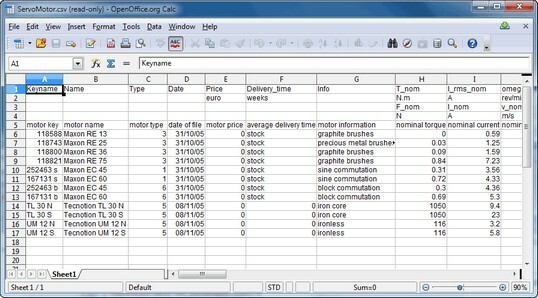 The motor parameters are visible in the Grid tab. These parameters are stored in a coma separated data file (extension .csv) or in an encrypted coma separated data file (extension .cse). The top 5 rows contain the description of the motor parameters and the corresponding units. The first and second row are used for rotation motors and the third and fourth row are used for linear (translation) motors. The fifth row contains the parameter names. 6. Do net enter other information in additional rows or columns. The Servo Motor Editor will try to read all cells and halt if the content is not according the specifications. 7. Do no add comment. 8. The last column entry (20-sim) should contain one white space character. 9. Store as comma separated file.